Fine wines, butler service, exclusive tours, the gorgeous French countryside rolling by—a week on the Scenic Emerald or the Sapphire showcases the best the all-inclusive luxury river-cruise market has to offer. 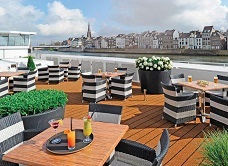 Life on Board: The Scenic river cruise ships make excellent use of public space on three levels—sun deck, indoor and outdoor lounge areas, a central bar and an elegant dining room. À la carte and buffet meals are augmented with one night of premium dining, with a multi-course menu and fine wines. In-room luxuries include a retractable balcony window, a bigger-than-usual bathroom and L’Occitane amenities. Ports of Call: Embark in Chalon-sur-Saône, with stops in Mâcon, Lyon, Vienne, Viviers, Avignon and Tarascon, before flying out of Nice. The cruise is offered in both directions. Each port nets you an incredible history lesson, gorgeous scenery, quaint medieval towns to walk through, Roman ruins, and the many gastronomic specialties of the area. In addition to a regional wine tour, the on-board wine experience is top-notch, with the list changing daily. Easy Schedule: Bus and walking-tour excursions are slated for the morning, so you have the afternoon free to explore the port of call, have a nap, go for an e-bike ride or read a book. Electronic Tour Guide: GPS-fitted personal gadgets let you follow the guide on group excursions, wander around by yourself on-shore or listen to the cruise commentary on-board as you sail past points of interest.